Ok, this is going to be a long post so bear with me, please. 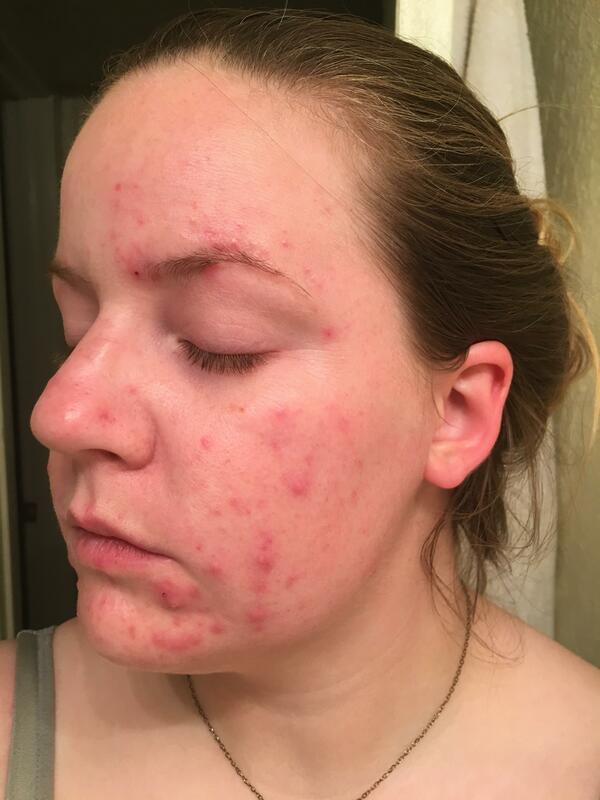 I am desperate for help.I am 27 years old and back in school so I have no insurance and can't see a dermatologist. In August, I decided to switch from Rodan & Fields Unblemished to TULA. I was wanting to get away from putting all of the harsh chemicals on my skin. I had extremely mild acne growing up and there really wasn't a need for me to be using the product. When I started using TULA I developed these small bumps around my jaw and chin. If I tried to squeeze them, nothing would come out. They were the same color as my skin but they were raised so you could still see them when the lighting was right. I tried TULA for 30 days and decided my skin was having some kind of reaction to it. I returned to R&F hoping my face would clear up but instead I have what looks like extreme acne on my jaw, chin, cheeks (limited amount), and around my eyebrows/forehead. I have stopped using R&F and have been using some Mary Kay my boyfriend's mom gave me just because I have been spending so much money on skincare products and I don't have the money to spend in the first place. I have tried charcoal masks, Neutrogena's Light Therapy Mask, jojoba oil, topical vitamin C, peels, microdermabrasion. 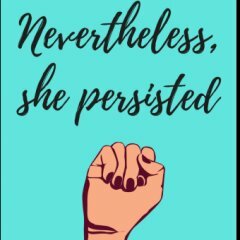 Today I decided to do more research because I can't continue to live like this. 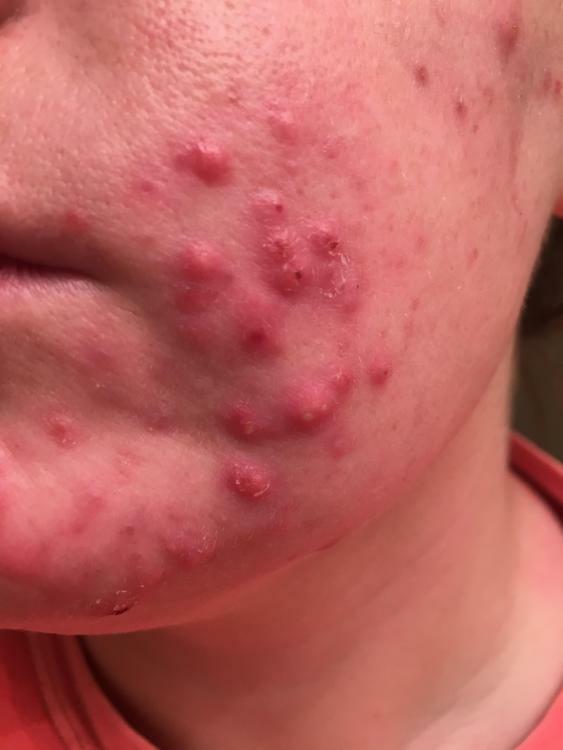 I started trying to figure out if this was acne or some sort of reaction. I thought it had to be acne since my face is covered in pustules. When they are ready to pop (I try to leave them alone as much as possible) a little white plug comes out of them (as well as pus) that I'm guessing is sebum. The pustules are painful and they itch. I originally thought the itching was from them healing since this is typical with cuts, but now I'm not so sure they should be itching. I saw some things about dermatitis and now I'm wondering if that is what's plaguing my skin. 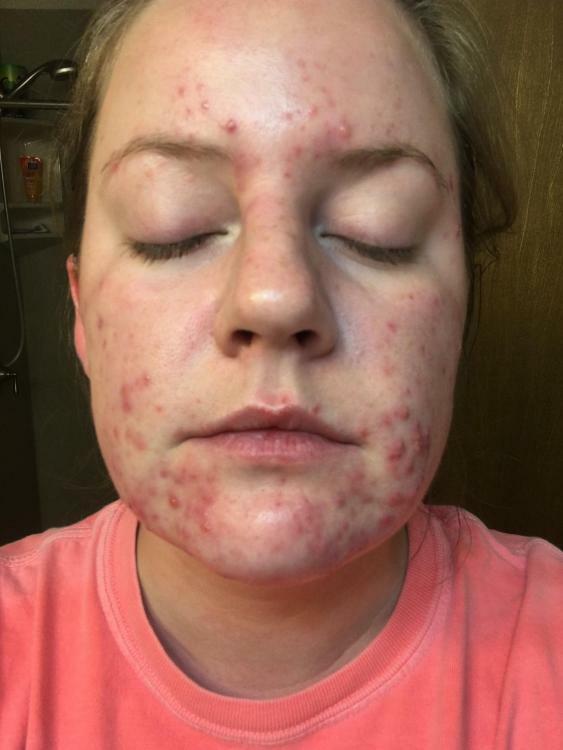 I'm wanting to try and find an answer so I don't continue to spend student loan money on every acne medication under the planet, especially if it isn't even acne! And then if it is something else, how do I treat it? I would really like this to be cleared up by February since my interview for grad school is that month and I would like to go into it with as much confidence as possible. I've attached pictures and will be more than happy to attach more if different angles are needed. Thank you in advance for the help and support! These first two pictures are from the beginning of October. These three pictures are from today. As you can see, it's gotten much worse over this month. You should be ditching all things on your face and going straight to your dr,do t leave without oral anti biotics.tetracycline or similar,no need for accutane so avoid it,if you can get a prescription stregth anti biotic cream also. suggest you just wash with warm water only and pat dry with a clean dry towel,just apply a moisturiser thats kind to your skin but first i would stay off moisturiser till you get your active stuff cleared up. dont start messing with diet etc etc,just get anti biotic,it will kill acne causing bacteria and therefore no acne. your skin looks quite red,maybe you got some rosacea? nevertheless,get to your dr asap,dont leave without oral anti biotic,di the course and you should clear up. avoid touching and picking as much as possible. Antibiotics?! Just go to the doctor and get some antibiotics. Sure... then deal with the repercussions of killing all good bacteria on and in your body. Then you create a worse problem because all of the sudden bad bacteria is taking the place of your normal microbiota that help combat the bad bacteria. Once you're off the antibiotics, it all comes back with a vengeance. Not to mention now the bad bacteria that can take over in your gut and cause all sorts of problems including weight gain, hormone imbalance, bloat, etc. And a healthy microbiota helps produce vitamin K2 as well as Biotin (vit B7) so now you aren't getting the micronutrients you need. Antibiotics are not the answer. Hello! I can totally relate to your story. I am also a new student in graduate school and can't afford to see a dermatologist, let alone the tons of acne products I try in desperation that something will help. I agree that antibiotics are not the answer - after many rounds of antibiotics back in high school, my acne only came back with a vengeance and it took a toll on my healthy gut bacteria (which I am still trying to remedy 6 years later!). I recently started a Whole 30 elimination diet to "reset" my body and attempt to find the underlying cause for my acne once and for all. 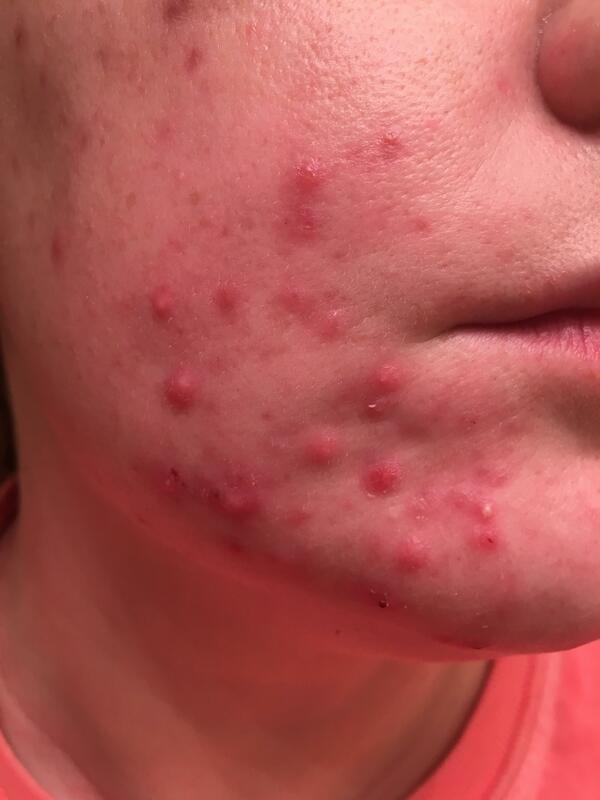 I had suspected for a while now that there was something in my diet that was causing inflammation in my body, as I have struggled with mild acne for as long as I can remember. More recently (within the last 2 years) my acne flared up again and looks very similar to yours. Rather than spending lots of money on topical products, I am hoping that this diet change will target my issue at its source. If you haven't heard of Whole 30, you basically eliminate all the things that cause inflammation in our bodies -- gluten, sugar, alcohol, dairy and legumes. After 30 days of elimination, you slowly add these foods back in one at a time to try and identify which foods cause a reaction in your body. It is similar to the paleo diet, but a little more restrictive. Many years back I did paleo for about 4 months, and saw a huge improvement in my acne, so I am hoping Whole 30 will not only clear up my skin, but will give me some answers as to what is going on inside my body. I'm only on day 7, and I can't say that I have seen any dramatic changes in my skin yet (I went into Whole 30 with a large breakout that is still clearing up), but I have noticed that my skin feels smoother and looks healthier, despite the active breakouts and redness. 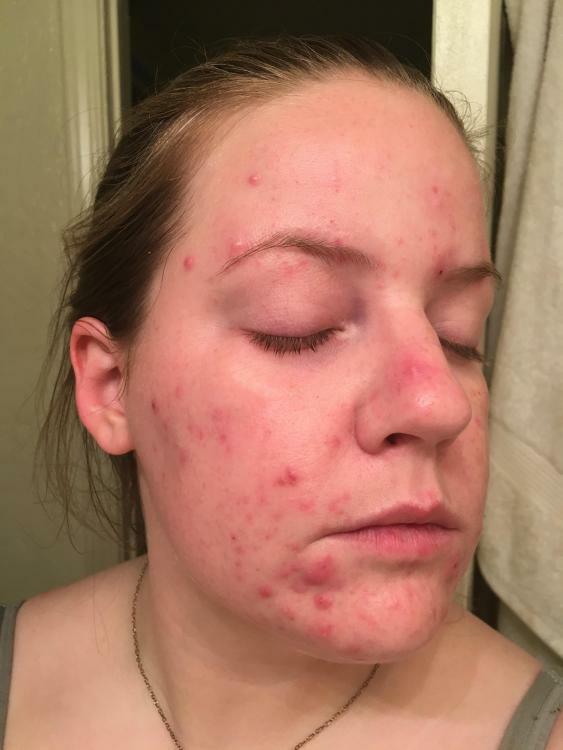 This is just a thought and suggestion -- I am a firm believer in the diet-acne connection, so it might be something you could explore! I dont know if you are putting snything on your skin,skin care products etc but your skin is realy red.if you are not using topicals or wash’s that make your skin red you might have rosacea. you seem to want a remedy but not anti biotic based so this is hard as not everybody has the same body that runs exactly the same etc.